In an exciting fall fashion move, Michael Kors has launched its Fall 2018 ad campaigns for Michael Kors Collection, Michael Michael Kors and Mens, with new photographers for the first time in more than a decade. The Collection campaign images were shot by famed photogs Inez and Vinoodh, with the latter two photographed by New York-based Lachlan Bailey, marking the very first time different photographers have been commissioned for the brand’s labels. Evoking a “sense of life in New York City as it’s really lived,” the MMK and Mens campaigns are inspired by the designer’s love for the city and the energy and ease of everyday life in New York, while the Collection campaign offers a modern take on the iconic jet set sensibility that has become synonymous with the Michael Kors brand. To celebrate the new campaigns, we’ve highlighted some of the must-have pieces featured in the photographs that should be in your closet for fall. Every jetsetter knows the importance of the perfect weekend bag, and Michael Kors has just the solution. The extra large version of the brand’s instantly iconic Bancroft satchel in crimson and camel leopard calf hair ($2,050) is the ultimate touch of chic for the well-traveled fashionista. For the most style-conscious traveler, there’s something to be said about outfit coordination. Drape Michael Kors Collection’s crimson tartan wool melton cape ($3,995) over your shoulders to capture the relaxed attitude of jet set glamour. It’s all in the details, as they say, and the same can certainly be said for your style choices. Everyone knows that the accessories complete the look, and this teal quilted Whitney shoulder bag ($458) is the perfect accent for business-meeting chic or an after-hours night on the town. Not one to leave the guys out, Michael Kors has recently upped the ante on the brand’s Mens offerings. 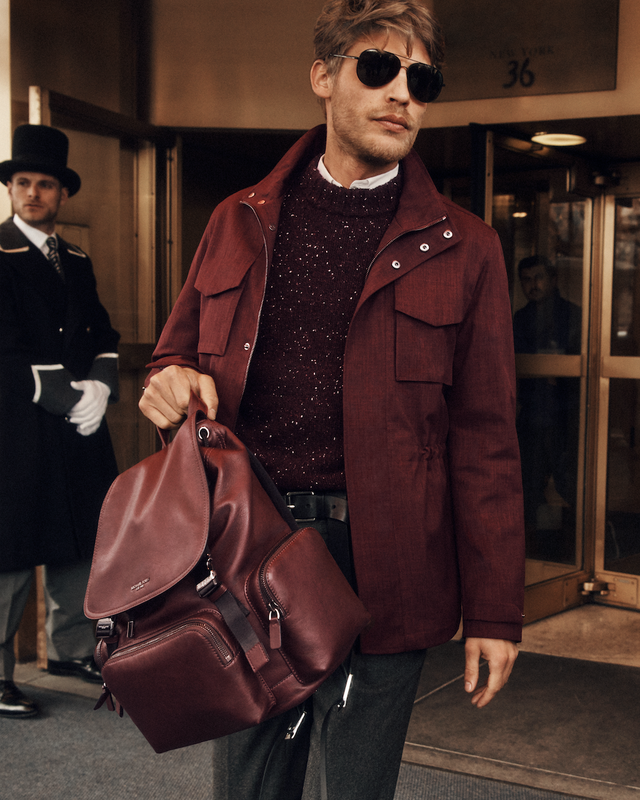 And even the coolest of men can benefit from the relaxed glamour of this cordovan leather Henry backpack ($448). It’s minimalist design and rich look might just make you jump on the backpack bandwagon. All products available at Michael Kors boutiques worldwide and on michaelkors.com.